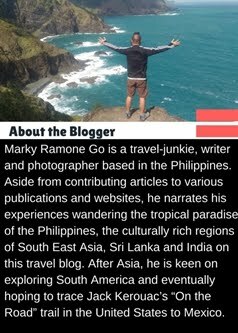 Why Go Backpacking in the Philippines? Whenever I hear the word ‘canyoneering’ before, I instantly associate it with the gorges of the wild outdoors of Colorado Plateau in the United States, digging from memory the glossy National Geographic pages I read growing up. Imagine my excitement when I started hearing word buzzing from Southern Cebu about a similar activity stretching from the waterfalls of Kanlaob, Alegria going downstream to Kawasan Falls in Matutinao, Badian. Both localities are located in Southern Cebu almost three hours from Cebu City. This part of the province teems with potential destinations catering to thrill seekers and nature lovers. When I joined my friends Josiah, Lisa Marie and Dane at Moalboal the previous day, my mind was set at the adventure that lies ahead of us. A huge part of me looking forward to our canyoneering jaunt, was psyching myself up at the idea of jumping from a 23 foot cliff and unto the flowing waters. Trying to channel the courage from the memory of my lone cliff jump experience; a 10-foot cliff dive at Cambugahay waterfalls in Siquijor Island, I also took note of the fact that the hurdle that awaits me doubles the height of that. Excitement and quiver lorded over myself. All of a sudden; the vocals of David Lee Roth keep ringing inside my mind “Go ahead an' jump (jump)”. Realizing a full day stands between me and that moment –I spent the rest of the afternoon just gazing at the spectacular sunset as seen from Lambug beach. We started early the next day so as to avoid the influx of people at the canyon trail. We arrived at the jump-off place which is the literal definition of it, because one has to ‘jump’ from the aforementioned 20-23 feet cliff to kick-start the canyoneering. There won’t be any opportunity to foster one’s momentum and gather adrenaline rush. It is either you’re in or you’re backing the hell out. And there is no way I’ve put all these gears; helmet and life vest just to chicken out. There were a small group ahead of us and one by one I saw them kill a few minutes before taking the plunge – with one girl almost taking forever. Understandably so, when I saw Dane took the first jump I reckoned it will be a walk in the park. However, when I planted my feet at the edge of the rock, looking intently at the guide’s direction on where I am supposed to drop, a moment of hesitation lingered over me. Fearing I might create a bottleneck of queuing jumpers, I slowly took a step backward, composed myself and stepped one foot forward again and decided to go for it. At that moment; Van Halen’s David Lee Roth should be proud of myself. My jump probably lasted a second tops, but it definitely felt longer as I sensed my body rapidly descending I was able to adjust my arms by putting it over my shoulders in an embrace position to cushion my impact. My body crashed into the waters with massive force brought together by law of physics and my 170 pound body frame. Immediately, I was swallowed a few feet underneath. I saw bubbles forming everywhere and a surreal moment happened, as If Brian Eno's ‘Deep Blue Day’ was playing as a soundtrack for that mere couple of seconds I was struggling to float. I relaxed both of my hands and feet to emerge and floated along the river water and unto a safe corner where I clung to a protruding rock. Rubbing my eyes and wiping my nose, I absorbed the high sensation generated by my jump. “That was fun” I told myself, wondering if I should climb over and do it again. Before I could fulfill that idea, one of our guides from Kawasan Canyoneering Company told me “may isa pa kasing taas nyan at tatlong optional” (There’s another one as high as that and three more optional jumps). At that moment, I was dead sure I will complete all jump including the three optional cliff dives our guide told me about. I hear Lisa Marie’s high pitched shriek signaling her own jump. She landed with a thunderous force producing a big squelch of water before she floated with a big smile on her face. Josiah was the last from our band to jump holding a selfie stick with his GoPro camera; he lets out a long “Wheeeee” until he landed on the water. Jubilation reigned as we high-five each other. For a couple of hours after our first jump, we found ourselves negotiating the canyons and admiring the stunning rock formations as it lay covered from the full glint of the sun, by the towering trees of a lush forest. In between – we floated along the crystal clear green waters of the flowing river which took us to pockets of lagoons and inside small pool caves. There are parts where you can slide over a smooth rock and unto a pool of water or make shorter hops. The river presents a variety of trail characteristics that makes the whole 4-5 hour canyoneering experience more exciting. My favorite part was where I just float on my back with arms and legs outstretched, while I stare at the partition of the blue sky above shadowed below by the jagged rock edges and bended forest trees. I sensed a new found freedom just eyeing at the circling images while I drift liberally in round motion. The landscape takes a more fascinating phase at the part where we started to see moss-covered stalactites dangling from the upper canyon walls, where drippings of water dishes out a shower-like appearance. One of our guides asked us to feel the warm water emanating from the wall. I touched the water and ran my palm over the drippings and even drank from it – as crystal clear as the cold waters of the flowing stream – it not only satisfied my thirst but also delighted my already adventurous soul. Slowly getting used to our chill exploration all over the gorges of the body of waters running from Alegria to Badian, our guides signaled us to climb a huge mound of rock already crowded with other canoers and surprisingly, a group of barbecue sellers. “This is the second jump” our guide told us. In the middle of nowhere I wondered about how the barbecue hawkers reached that spot and asked one of them. A lady vendor pointed to a rope which they use to climb to a trail leading to the forest and to a nearby community. We took advantage of this pit-stop to hydrate from our bottled waters and a few sticks of grilled hotdogs as we watched the others took turns in leaping. The height is almost similar to our first jump but into a tighter pool. Again, I followed the same strategy of mentally marking my landing spot first, taking a step back after to make a deep breath and stepping forward to make my jump without wasting a thought into it. In a split second I again hear that deafening splash! Trailed by the sensation of being underwater again. Recapping the extraordinary high I felt from my first jump. The trail slowly transforms to a different backdrop after that, as we start to walk over land and unto small pockets of streams before leading to a larger lagoon where a soaring 40-feet tree is rooted firmly by the base of the large natural pool – to which our guide pointed to as the ‘first optional jump’. I entertained the notion of climbing the tree to jump but I resigned to a feeling of exhaustion. I just watched a group of local kids and a few foreigners climb up one of the thick tree branches before they dived into the water accompanied with menacing yells. The subsequent optional jump was a few minutes away and it is the second highest along the canyoneering trail. We all agreed of reaching our quota of waterfall jumping experience – so we again passed up this leaping opportunity. When we arrived to visually check out how high it is, a Caucasian guy was on the verge of hurdling himself. He sighed out a few murmured words and did a sign of the cross before he threw himself. I saw a roaring splash below me and while I saw him emerged with a wide grin, every bit of courage remaining in myself of jumping vanished instantaneously. “That was bloody high” I think to myself with a thick English accent. The highest of course, was the 40-meter high Kawasan Falls. While filming it from a nearby vantage point, we saw our guide Bonny dropped his pack and unflappably positioned himself at the edge of the waterfalls’ mouth. “Watch” he tells us in a cool demeanor like he’s done this dozens of times before. He surveyed the water beneath him and stood in a backflip position. A few seconds later, he dazzled us with a somersault movement in the air and a perfect ten dive entry to the waters below, eliciting a thunderous applause and amazement from the people below. Emerging at the base of Kawasan Falls with weary bodies but with euphoric spirits, we capped our own canyoneering experience by dipping and going for a swim at the sparkling green waters. A back massage courtesy of the heavy flowing waters of Kawasan served as the icing in the cake for a wonderful day filled with thrills and a fresh appreciation at the grandeur set of nature that exist on this part of Cebu province. How to Get Here: Book a Cebu Pacific flight to Cebu City - then take a bus heading to Badian / Kawasan / Samboan at the Southern Bus terminal and get off at Kawasan Resort which is along the highway. All photos from Josiah Sicad of Lakas ng Trip.